The profound impact of machine learning (ML) and artificial intelligence (AI) is changing the way heath organizations think about many of the challenges they face. Making data-informed decisions based on actionable insights is improving many aspects of healthcare from patient diagnosis and outcomes to operational efficiencies. While making decisions with deep insight into relevant data, healthcare organizations must be especially mindful of how they implement such solutions. Regulations like HIPAA and HITRUST compliance require data be kept secure, private and anonymized for those who don’t require access to patient data. Further, IT staff are often unprepared or understaffed to implement such solutions. This is why the Azure Healthcare AI Blueprint was created, to bootstrap AI solutions for healthcare organizations using Microsoft Azure Platform as a Service (PaaS). After installing the blueprint, organizations can learn from the reference implementation and better understand the components of a complete solution built with Azure services. The blueprint is installed to Azure via PowerShell scripts, and creates a complete environment that can run Azure Machine Learning Studio (MLS) experiments right away. In fact, there is a simple patient length of stay (LOS) experiment built right in. Other demo scripts are also available if you want to delve further. There is a script to admit 10 new patients and one to discharge two patients. Running these scripts is covered in the blueprint documentation. 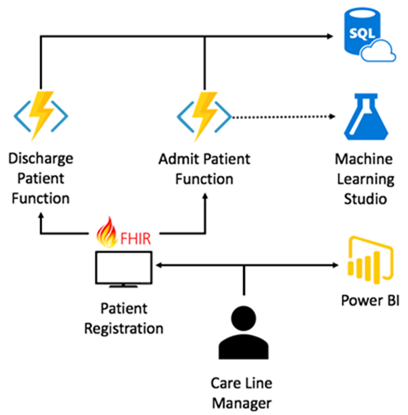 The care line manager submits newly admitted patient data that is immediately available via a Power BI dashboard, but also is processed by the LOS machine learning experiment. The patient’s data is input into the patient registration system. The system invokes an Azure function with the data in the Fast Healthcare Interoperability Resources (FHIR) format. The Admit Patient Azure function stores data to an Azure SQL database and to MLS where it is used to predict the patient’s LOS. When patients are admitted or discharged from the facility, another Azure function writes the data to Azure SQL database. There are many other services in the overall solution such as monitoring and security. But MLS is where the magic of the LOS experiment happens, driving operational decisions such as staffing and projected bed counts. There are many components and services in the blueprint, and we’ve examined just a few that are used for a single LOS experiment. More sophisticated algorithms and models are used for more complex scenarios. Read about the Azure Healthcare AI Blueprint to see if it’s a good fit for your organization. This could serve as the catalyst for your organization’s change to data-informed decision making. Download the scripts, install instructions, and other artifacts in the blueprint on GitHub.